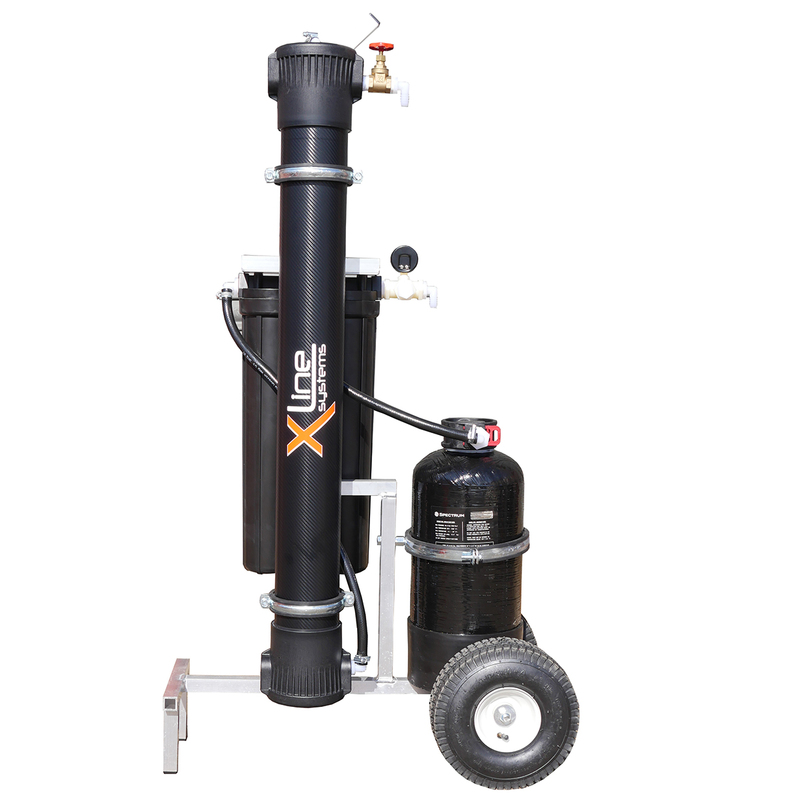 This 4-stage portable R/O system is the ultimate in pure water filtration, designed for those that want hassle free and low day to day maintenance to produce bulk water on a massive scale and in the shortest time possible. This system offers filling times of around 200ltrs an hour based on an average household tap pressure. Comes complete on an Aluminium frame housing all components designed to stand on the floor. This system is mounted on an aluminium trolley, with heavy duty tyres allowing you to easily transport the system between locations. As with all reverse osmosis filter system, the higher the tap pressure from your water source the better this system will run, as this helps to produce water quicker and to also keep your running costs lower over time. Ideally this system needs to have a tap feed of around 60-90psi. Most UK households have poor tap pressure (less than 50psi) causing fill times to be slower and to increase running costs. We always recommend if you have a feed of less than 50psi then a booster pump will be needed to boost up the pressure. We can supply all of our filtration systems with a booster pump if needed. 1 x 20” 5 Micron Sediment Filter Made From 100% Pure Polypropylene Fibres, Removes Dirt, Sand and Rust. 1 x 20” Carbon Block Filter, Composed of High - Performance Carbon, Removes Trihalomethanes, Pesticides, Volatile Organic Chemicals and 99.95% of Giardia and Cryptosporidium Cysts. 1 x The SRO 40” R/O membrane is capable of producing up to 9,500 ltrs of pure water a day. With ultra efficient (99%) rejection rates of the SRO -4040, with its low operating pressure capabilities (6.8 bar) make it an ideal energy saving, economical, high efficient membrane. 1 x Pressure Gauge and waste valve used to flush the filtration system and manually set the product to waste ratio produced from the Reverse osmosis filtration system. These systems are designed to run for long periods and produce up to 9,500 litres of pure water a day. By having a static system will allow multiple vehicles to draw pure water from the system on tap sharing running costs and without the need to purchase a filtration system for every vehicle. Static systems will allow you to use more than one fill of water per day, where van mounted filtration systems would simply take too long to produce a second fill of water to return out to work on the same day. By having the option of refilling the tanks throughout the day gives the option of having a smaller tank in a smaller vehicle. It takes several hours to produce water by the method of reverse osmosis therefore having a static filtration system will allow you to use the vehicle in the evenings when van mounted systems would usually be connected to a tap supply for several hours during the filling process. On average you will find your annual running costs to replace the filters inside this system will cost less than £150 per year. Essentially you have to replace the 2 pre-filters every 3-4 months (as these help to keep the main R/O membrane cleaner over time), you then replace the resin inside the D/I vessel as and when your water is no longer pure enough to clean windows (we change ours when our TDS level reaches 004ppm). The main 40” R/O membrane should last around 3-5 years on average.